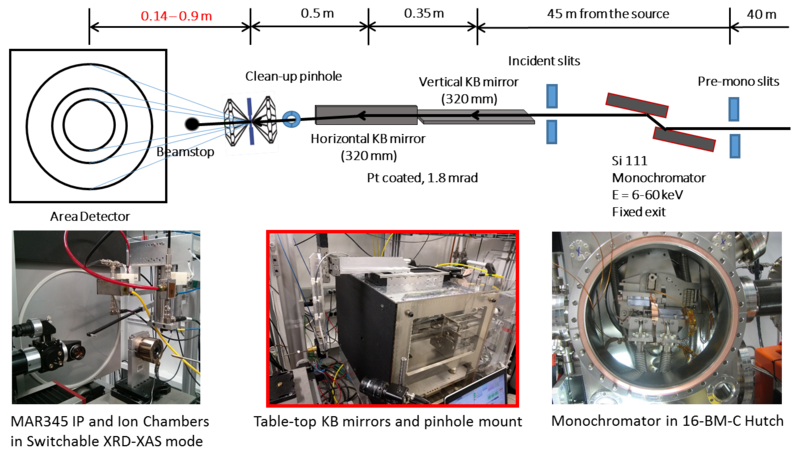 16-BM-D’s general X-ray diffraction setup is relying on the optical components optimized for micro-X-ray diffraction experiment with various types of diamond anvil cells (DACs). The goal of this setup is to deliver a clean micro-focused beam to the sample under pressure in a DAC. Some of the essential optical components are located in 16-BM-C hutch, including pre-monochromator slits (white beam slits), Si 111 double-crystal monochromator, and post-monochromator slits (monochromatic beam slits). In 16-BM-D end station, beam intensity and its vertical position is monitored by an ion chamber (IC 1) and a split ion chamber (V-BPM), respectively. The beam into the table-top KB mirrors is defined by the beam-defining slits after the V-BPM, and the focused beam after the KB-mirror is guided by a clean-up pinhole. 1. Park, C., et al., New developments in micro-X-ray diffraction and X-ray absorption spectroscopy for high-pressure research at 16-BM-D at the Advanced Photon Source. Review of Scientific Instruments, 2015. 86(7): p. 072205.